The 2nd photo makes it look worse than it is. Basically, a fairly smooth dirt/gravel road. The race flyer says to "bring extra wheels...there will be flat tires." I'd like to avoid flats and would lean slightly toward puncture resistance at the expense of rolling resistance, but I'm not crazy about using my Gatorskins. What tires would you suggest? Conti GP 4000? Chili? 4 Season? Attack Force? Other suggestions? I'd err on the side of puncture protection and run slightly lower pressure. I ride a lot of gravel roads, far worse than that, on 25's. Your flats are going to come from pinchflats, not punctures. You want a tire with a stiff/tough sidewall and as much volume as will clear your frame. Lower pressure is actually counterproductive on the sharp edges of those gravel bits; run normal 100psi or so. I use Conti 4000's the ones with the kevlar. I've raced/ridden on 23c armadillo pros and 28c gatorskins.. both worked well. GP4000 in 25mm. Should be fine. I'd run training tubulars at reduced pressure if I had the wheels for it. I ride a lot of gravel around Boulder and Nederland, my Conti GP 4000s have been great, no complaints. I don't know some of the tires mentioned personally but having ridden a lot on dirt and gravel roads, I think the following will help. 1. Wider than normal tires. 25 would be the next size up for a clincher (from 23), 23 for a tubular (from 20-21). This is to help prevent sinking in as well as make it a bit of a softer ride. 2. I wouldn't reduce tire pressure, I just wouldn't go super high. 110-130 psi. 3. Tubulars will flat with sidewall cuts/slashes from a perfectly placed rock. 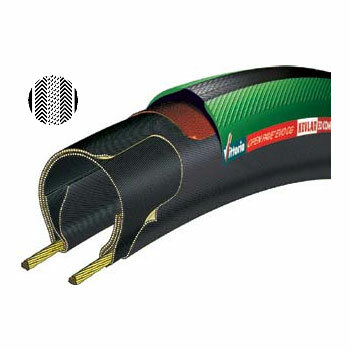 Get thick sidewall tires, clincher or tubular. 4. Pinchflats will kill you with clinchers, hence keep the regular pressure. Other tips on riding the rough stuff. It doesn't actually look too rough, but if it's bumpy, keep it in the big ring as long as possible. A big-big gear will put more tension on the chain, helping prevent it from bouncing around (and into your wheel, off the cranks, off the derailleur). Small-small just invites disaster on bumpy roads. Also maintain a soft grip on the bars. Let the bike guide itself, to a point. Look for the firm stuff, even if it's a bit out of the way. Thanks everyone. Sounds like GP 4000 25's would do nicely. And many thanks for the tips, cdr. The big-big thing had never occurred to me.